This deal is in your Shopping Cart. We'll notify you on the Amazon site, or you can turn on waitlist notifications in the Amazon App on your phone. 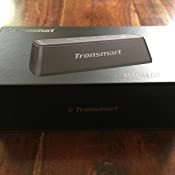 Sold by Tronsmart-AU and Fulfilled by Amazon. Gift-wrap available. 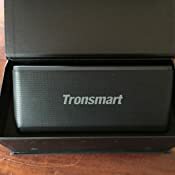 Why Choose Tronsmart Bluetooth Speaker? Built-in 2*3300mAh battery means that you can play music up to 15 hours, NO worry about battery life. 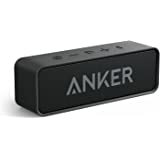 Featuring Advanced Bluetooth 4.2 technology, connect to any bluetooth devices quickly and simply. NFC chips for touch pairing from compatible devices. Just control the TWS master device, then audio can be played in sync on both devices with double enhanced stereo sound. Performance Pledges all buy from Tronsmart are entitled to one year free warranty and lifetime service for the provision of technical services. I ordered this wireless speaker few days ago and it’s already here . Great delivery service and on time . Quality of material is of its best and the sound is perfect . 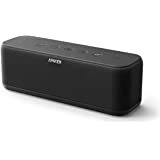 I never thought it would be that great but it’s over my expectations as I have bought wireless speaker before that didn’t had great sound. I’m so happy with this wireless speaker and it look so great ..... now I can listen music in my house while cooking and doing anything. Don’t have to carry my phone or speaker with me cause it have its own great loud volume. In my opinion , this is the best speaker I ever had. These speakers are in no way comparable to bookshelf speakers. You won't get the rich, dynamic frequency range of "old fashioned" wired speakers. 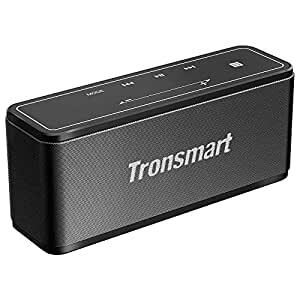 Putting that expectation aside, in comparison to tinny bluetooth speakers, the Tronsmart Mega far exceeds most others. They have a reasonable bass and top-end - something you don't get with most other speakers of this size. And for the price, they're good speakers. 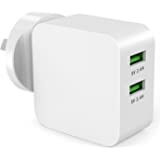 Unfortunately, the speakers don't allow you to leave them plugged in, so you won't be able to leave them as permanently powered speakers, as this decrease the life expectancy of the battery. The whole top lights up, which during the day creates a cool look. But during the night, could provide too much light for, say, a bedroom. 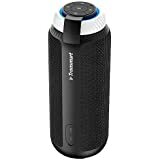 I’ve only had a few Bluetooth speakers over time and I thought I’d give this one a go..
I’m not sure if mine was a little defective or not but I found the sound quality to be just okay, I listen to mainly electronic music of most variety’s and anything past 40-50% volume would make the speakers distort and there was no increase in levels of loudness.. battery life was alright for a bigger heavier unit like this. The touch panel wasn’t for me as sometimes grabbing it in different ways could cause you to spike the volume up. The aesthetics of the speaker is nice, but in the end I returned mine as I just wasn’t happy enough with the sound.. I received this last night and I have to say that I was very impressed by this speaker. It looks great in my kitchen at home, and provides beautiful sound while I'm cooking. The speaker is far more powerful than you would expect given its size, with crystral clear response and no distortion even when turned right up. While the overall construction and quality of the speaker is very high, I wanted to particularly highlight the NFC pairing. 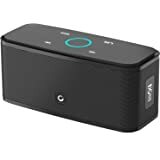 I use an android phone and my wife has an iPhone, and both of us were very quickly and easily able to pair our respective phones with the speaker simply by holding the phone over the NFC symbol on the speaker. I have tried similar systems in the past and always found them to be rather clunky, so I was very impressed by how smooth this one was. I honestly can't recommend this speaker highly enough! 5.0 out of 5 starsSo awesome, strongly recommended! Impressed with the this speaker outlook and sound quality. The pairing process took as fast as a few blinks of eyes. 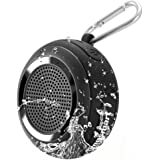 Sound quality is top notch and this speaker can even turn on my iTunes music files remotely. 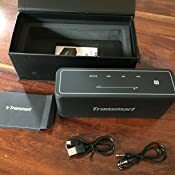 I have been listening to the Tronsmart mega 40w speaker for over 2 weeks and find the sound to be quite pleasant when listening to certain types of music. i.e. rock, trance style POP with lots of extended BASE. For a small speaker they really do pump out the sound. I have connected and listened via phone and laptop and they are really so so simple to pair and connect. Battery life is excellent too I got over 14 hours out of the speaker so that is a big PLUS for the mobile listener! 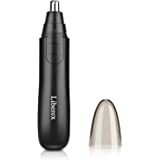 All in all great value for money due to the sound cost and ease of portability. When listening to quite or ambient music there seems to be a dithering wavering sound as the Bluetooth transmission intermittently wavers while transmitting. Line in was not very good but (HEY) it is a Bluetooth speaker who really wants to use the line in anyway??? Excellent value for money. Arrived via Amazon bang on time. Also received some advice as to what setting, (bass, treble, rock, etc) to lock in your speaker. If you have an i phone go to settings, music and under the heading "playback" press the "EQ" bar. This will let you in to the different modes / tones to suit your output / sound preference. 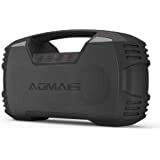 There are loads of more expensive speakers out there, but for me this an excellent product which more than satifies my use in the house, yard etc. 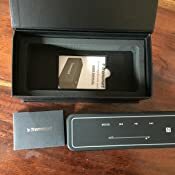 5.0 out of 5 starsClear and solid sound! I have hearing aids, but still very poor hearing. I needed something to listen to YouTube, news apps' etc. via my smartphone or tablet. As I am particularly interested in political world news out of the Middle East, America etc. A group of people can sit around a room, and the sound is strong and clear just like a good quality radio, with plenty of volume. You wouldn't know it's coming out of a phone. I would strongly recommend this product. Not expensive for it's quality!